Did a tweet from The Rock send Neutrogena to new perception highs? Can an offhand Twitter mention from The Rock move product? 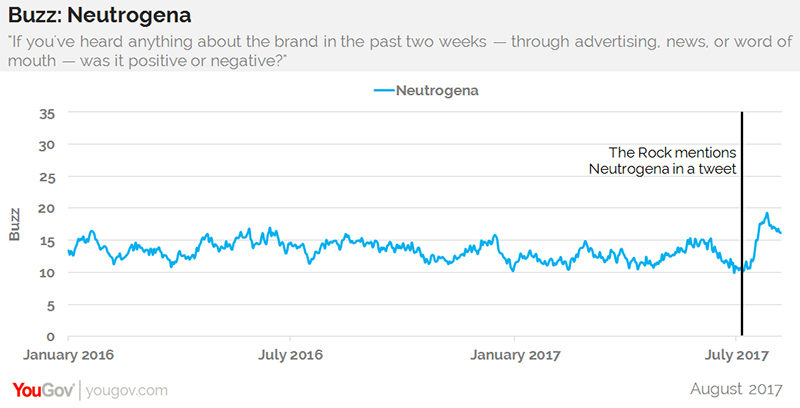 A singular plug from Dwayne “The Rock” Johnson on Twitter appears to have helped Neutrogena achieve its highest consumer perception and purchase consideration levels in three years, according to YouGov BrandIndex. Since that exchange, which was reported in several mainstream publications, such as GQ, Elle, and People, Neutrogena’s Buzz score (“If you've heard anything about the brand in the past two weeks — through advertising, news, or word of mouth — was it positive or negative?”) shot up to its highest mark since August 2014, after the company launched its “Junkface” campaign for men. 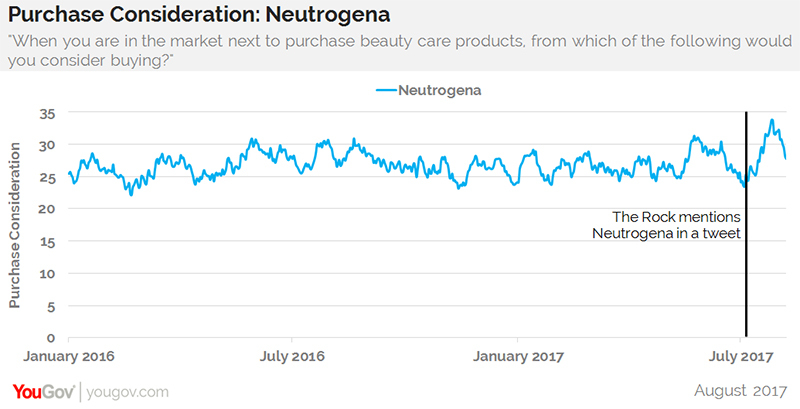 Of even more interest is the tweet’s apparent impact on Neutrogena’s Purchase Consideration score, a key measurement of potential future revenue. Just before the July 6th Twitter exchange, 23% of consumers said they’d consider purchasing Neutrogena the next time they were shopping for skin care and cosmetics products. By July 26th, however, that percentage increased to 34%, and currently sits at 28%.